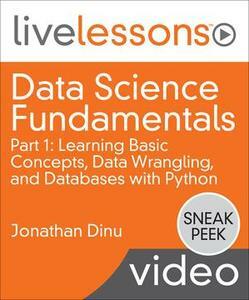 Data Science Fundamentals LiveLessons teaches you the foundational concepts, theory, and techniques you need to know to become an effective data scientist. The videos present you with applied, example-driven lessons in Python and its associated ecosystem of libraries, where you get your hands dirty with real datasets and see real results. If nothing else, by the end of this video course you will have analyzed a number of datasets from the wild, built a handful of applications, and applied machine learning algorithms in meaningful ways to get real results. And all along the way you learn the best practices and computational techniques used by a professional data scientist. More specifically, you learn how to acquire data that is openly accessible on the Internet by working with APIs. You learn how to parse XML and JSON data to load it into a relational database. You get hands-on experience with the PyData ecosystem by manipulating and modeling data. You explore and transform data with the pandas library, perform statistical analysis with scipy and numpy, build regression models with statsmodels, and train machine learning algorithms with scikit-learn. All throughout the course you learn to test your assumptions and models by engaging in rigorous validation. Finally, you learn how to share your results through effective data visualization.